Thangka is a Silk painting with embroidery, usually showing a Buddhist god, famous scene, or a mandala. The Thangka is very different than regular oil or acrylic painting. It is a piece of picture which is painted or embroidered, over which a fabric is attached, and then over which is laid a cover, usually silk. Generally Thangkas last for a very long tenure. It is delicate and hence, should be stored in dry places. Moisture is not at all good for it. 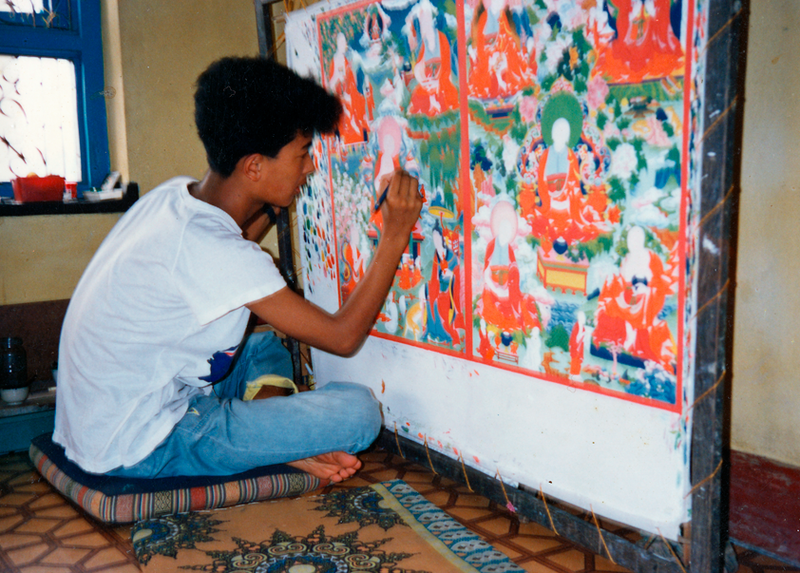 Thangka is also known as scroll- painting. Thangka is a Nepali form of art exported to Tibet by princess Bhrikuti ( Harit Tara – daughter of Ansuvarma) of Nepal (7thCentury) married to Sron Tsan Gampo, the then ruler of Tibet. 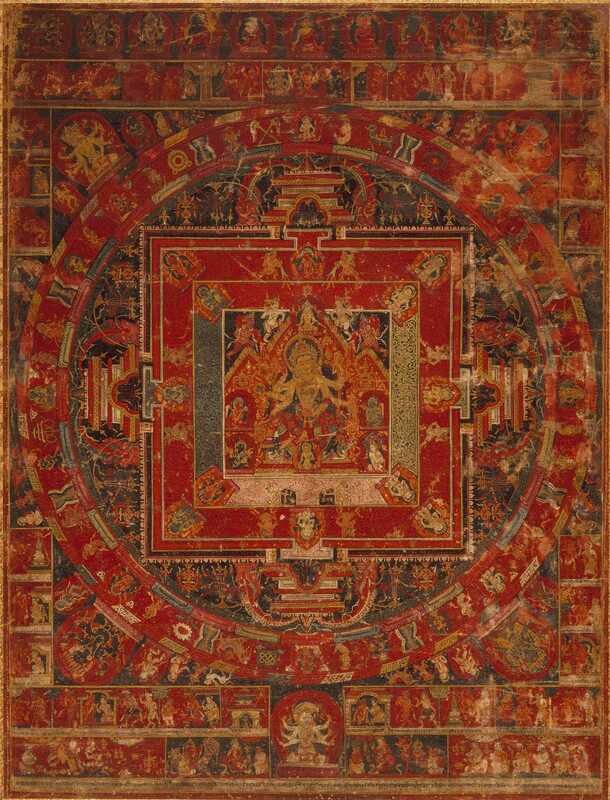 The word “Thangka” is believed to have come from the Tibetan word “thang yig” meaning a written record. Originally, Thangka paintings became popular among travelers and monks as a teaching tool to illustrate life history of Gautam Buddha, lamas, other god / goddess and bodhisattvas. One of the most popular subjects seen in Thangkas is “The wheel of life” which is the visual representation of Abhidharma teachings or the art of enlightenment. These religious paintings offer a beautiful expression of both being visually and mentally inspiring. Typical Thangkas are fairly small, between about 18 and 30 inches tall or wide, there are also giant festival Thangkas, usually Appliqué, and designed to be unrolled against a wall in a monastery for particular religious occasions. These are likely to be wider than they are tall, and may be sixty or more feet across and possibly twenty or more high. 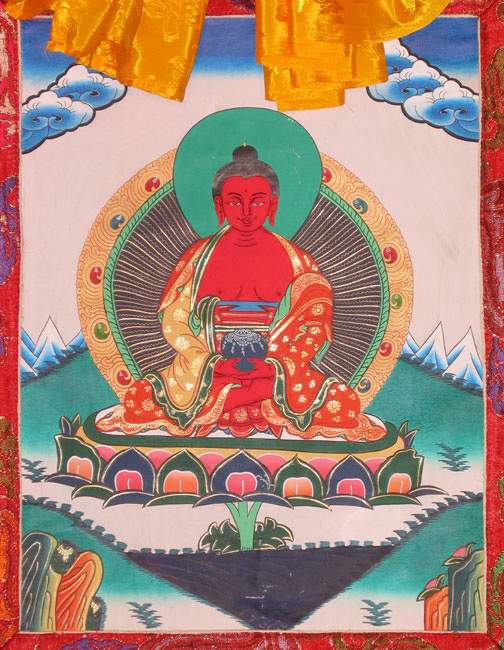 Thangkas are painted on cotton or silk. The most commonly used are loosely woven cotton produced in widths from 40 to 58 centimeters (16 – 23 inches). While some differences do exist, Thangkas wider than 45 centimeters (17 or 18 inches) normally have layers in support. 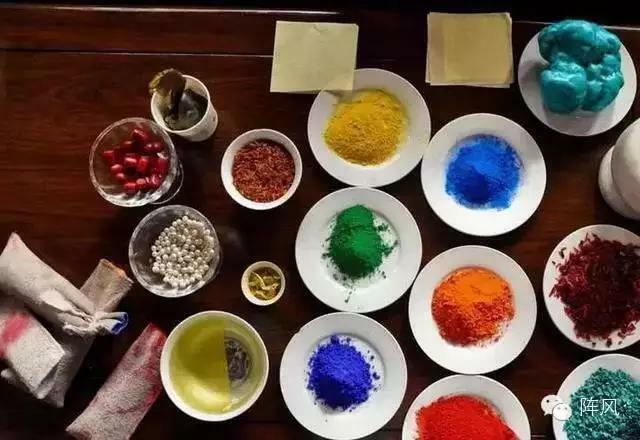 The paint consists of water soluble dyes. Both mineral and organic pigments are used, hardened with herb and glue solution. In Western terminology, this is adistempertechnique. The composition of a Thangka, as with the popularBuddhist art, is highly logical. Arms, legs, eyes, nostrils, ears, and various ritual implements are all arranged out on a systematic web of angles and intersecting lines. A skilled Thangka artist will usually select from a range of predesigned items to include in the masterpiece, extending from alms bowls and animals, to the shape, size, and angle of a figure’s eyes, nose, and lips. The procedure seems welldisciplined, but often requires deep understanding of the imagination involved to capture the spirit of it. 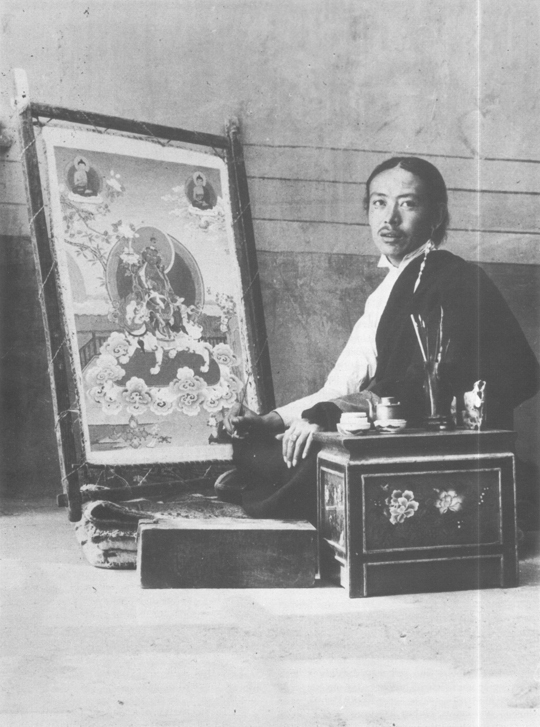 There are different kinds of Thangka employing various canvases. However, most are painted on cloth or paper. The white cloth is first mounted on a frame and water-based colloid chalk is applied to the surface. It is polished with talc when dried. The canvas is thus ready for painting. Apart from this, there are Thangka which are webs of embroidery, woven silk, silk tapestry or appliqué. 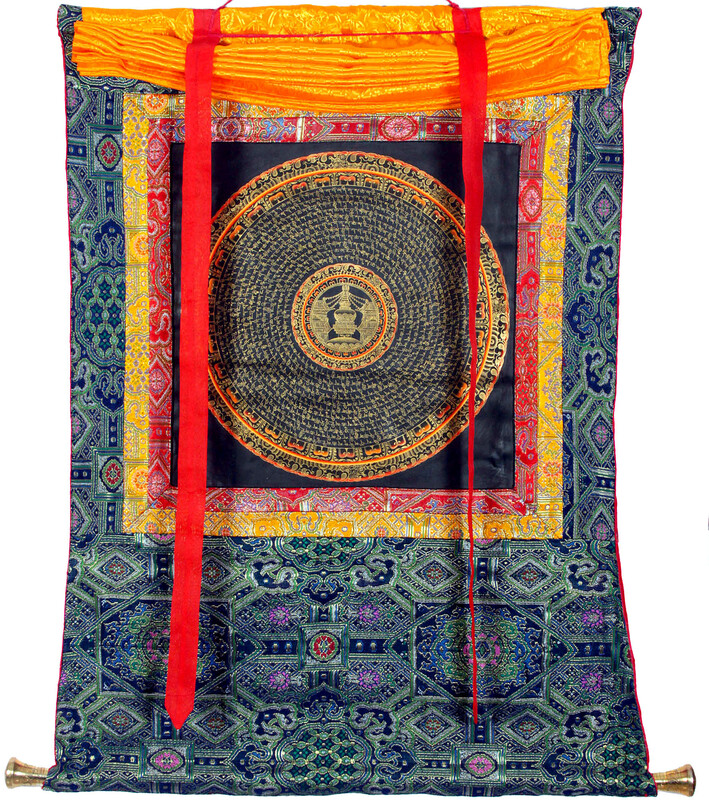 Embroidered Thangkas are done with multi-colored silk threads. Silk woven Thangka take the warp of brocade as the base and applies the method of jacquard weaving with colored silk threads as the weft. With appliqué Thangka, human figures, designs and patterns are cut out of colored satin and glued onto the canvas. The resulting work is also called “embossed embroidery.” Tapestry Thangka are woven with the method of “complete warps and broken wefts: which calls for the application of the weft threads on the warp only where the picture or design needs it. The “hollowed out” work produces a three- dimensional effect. Tapestry Thangka are thick, closely woven, delicately designed and gorgeously decorated with colored silk threads. There is yet another kind of Thangka in which beautifully designed colored fabrics decorated with pearls and precious stones are attached to the fabric with gold thread thereby creating a resplendent and dazzling effect. Line drawing is created with complete accuracy, proportion and detail, of the deity or desired image. Then portions of the drawing are transferred by tracing to the silks that will be used in the final piece. Definition of line details is created by rolling silk thread over cord and then by carefully hand-stitching this to the silk pieces. The pieces are then cut out and edges turned under and ironed. Piece by piece the image is created with all its detail. Features such as eyes, jewels and flowers are masterfully stitched using special embroidery techniques. Next the individual pieces are joined together, first using glue and then stitched along every edge so that the pieces form the completed image. Lastly there are some finishing stitches and additions of gems such as Tibetan turquoise and coral are added. The image is then framed in silk brocade. Thangka often overflow with imagination and reference. Because the art is clearly religious, all symbols and references must be in accordance with strict guidelines laid out in buddhist scripture. The artist must be properly trained and have sufficient religious understanding, knowledge,and background to create precise and correct Thangka.